I wrote recently about the Alonzo F. Bonsal Wildlife Preserve in Montclair. This urban forest is the remnants of wetlands and uplands that surround the Third River. The river is a major tributary of the lower Passaic River watershed. The source (headwaters) of the Third River are in Rifle Camp Park in Woodland Park. The headwaters were impounded in 1899 to form the Great Notch Reservoir which greatly reduced the river’s flow. The Third River’s current name was derived from the fact that it lies north of two other Passaic River tributaries - the First and Second Rivers. At one time, the river was known as Pearl River due to the discovery of the "Queen Pearl," also known as the "Paterson Pearl." Freshwater pearls are found in a river’s mussel population. The Paterson Pearl was a 93 grain pink pearl and was one of the first freshwater pearls to be discovered in the United States. Other pearls were found in the Third River but none matched the Paterson Pearl. Although freshwater mussels are most diverse in North America, where there are 281 species and 16 subspecies, they are among the most rapidly declining animal groups on the continent. The Nature Conservancy recognizes 55% of North America's mussel species as extinct or imperiled compared to only 7% of the continent's mammal and bird species. The Paterson Pearl was discovered in Notch Brook, near Paterson, in 1857 by a carpenter named Jacob Quackenbush. It started a "pearl rush" that almost stripped the streams of Notch Brook of freshwater mussels and led to the discovery of some lesser pearls but worth around $15,000. The pearl rush flowed over to other streams and rivers in New Jersey and it had a very negative impact on mussel populations. High quality pearls were found the Rock Road Brook, the Godwinville Brook and Cherry Lane Brook. The exploitation of the freshwater mussels in the waters of Passaic county and other counties depleted the mussel population, and within a few years the entire population of mussels were totally decimated. That eliminated the natural pearl industry. 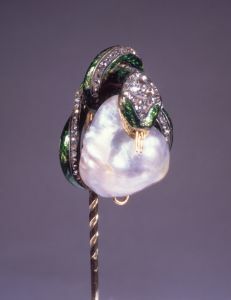 The pearl fever spread to other states, and pearls were discovered in New York, Ohio, Texas, Arkansas, Florida, Connecticut, Mississippi and Wisconsin. pearl believed to be the "Paterson Pearl"
The "Paterson Pearl" was purchased by Charles L. Tiffany of Tiffany & Co. New York City, for $1,500, and as it was difficult to find buyers for the pearl in the United States, the company sent it to their Paris House for sale at 12,500 francs (about $2,500). The French dealer sold it to Empress Eugenie de Montijo, the Queen consort of Emperor Napoleon III, and it then became known as the "Queen Pearl" or the "American Queen Pearl" or the "Tiffany Queen Pearl." Other extraordinary pearls are also sometimes referred to as "Queen Pearls." Today, the mussels and pearls are long gone from these waters and the name Pearl River has been replaced by Third River as designated by cartographers. Endangered NJ looks at the endangered and threatened wildlife, natural resources, historical preservation and environmental issues with a special focus on New Jersey. Is That a Mountain Lion I See Wandering New Jersey? Have You Seen a Coywolf in New Jersey? Thanks to BCAS for Barn Owl Boxes! Endangered New Jersey by Ken Ronkowitz is licensed under a Creative Commons Attribution-NonCommercial-ShareAlike 3.0 Unported License.